Hello there! It's time for our first group post for Papertrey Ink's April Release. Today's set is one of my favorite of the release. Ok....maybe I will say that about everything but I do really love these set! 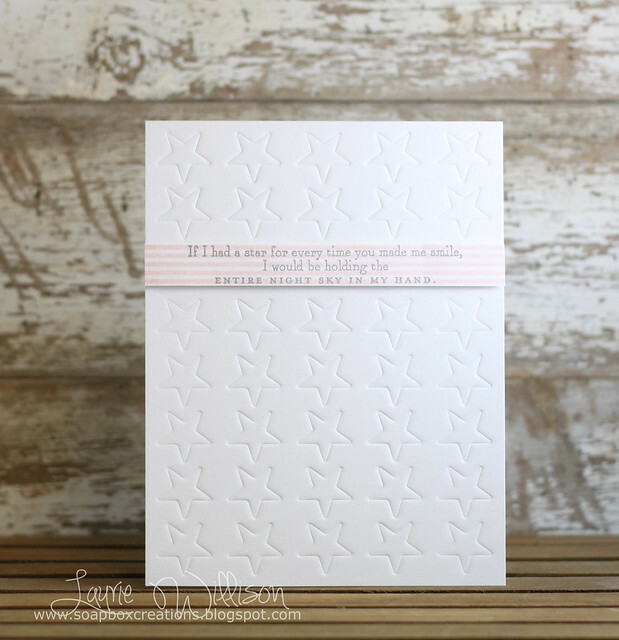 Our challenge was to find some Pinterest inspiration and make something masculine and feminine using the Simple Stars set and Cover Plate: Stars. My first card was inspired by a picture I found of a blanket. I adore this color combo and had to go with it! Seeing these colors, I made my first card with my daughter in mind. It is super simple to make but still so girly and elegant. I used the cover plate to emboss the card base. I used Background Basics: Super Stripes and stamped a row in Sweet Blush. I added in a sentiment in gray over the top, then popped it up on foam tape for some dimension. Can you tell I love Super Stripes? 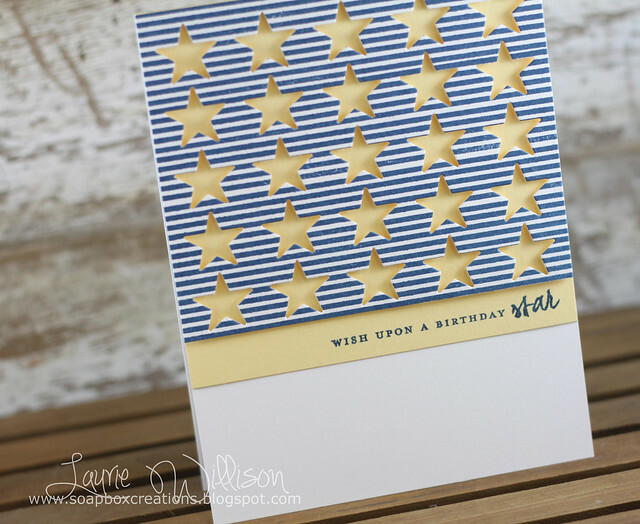 Yes, I used it again here and covered a piece of white card stock in stripes and then used the Stars cover plate. I layered it up with some Lemon Tart card stock and stamped the simple sentiment. I know the rest of the team have amazing cards and projects for us to see! Here is a list of stops to make! Love your cards, Laurie. So simple, but really pack a punch! Oh, I love both of these, Laurie! Your cards are the Star of the Show!!! I LOVE them both! It is going to be 80 up here in OP, how about you guys? Warm down there, too??? Pretty cards, I especially like the first one! 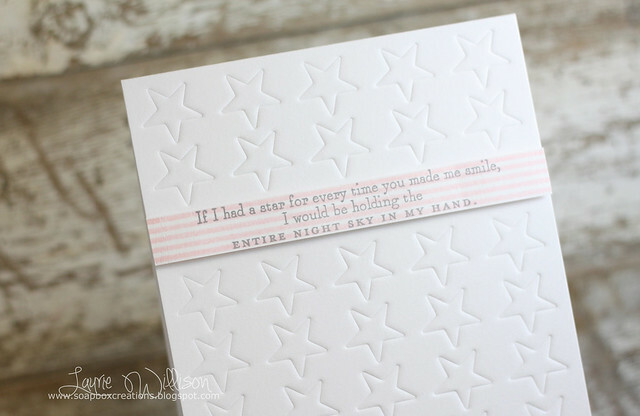 The second card caught my eye on Nichole's blog. You brought new life to a very traditional color combination. Fabulous. OMG that star plate is a must have!! LOVE stars! Great cards, Laurie! Such sweet cards! I absolutely adore the little boy's card! Two great cards. I like the thought of using the cover plate as a stencil. The white-on-white look is a classical beauty. Gorgeous cards, Laurie! 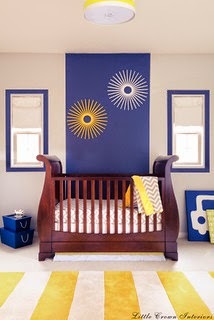 I love how you played off the colors on your inspiration photos...so pretty! Oh boy, I love these! These are BOTH so great, Laurie, can't say which I love better! Love both cards, but the star cover plate use on the striped dp is soo sharp. I love these!! My favorite is the blue striped one! It's awesome! I love this star die! What a very useful die for anyone on your list. Your cards are great!